About a year and a half ago, I gushed over what an amazing story Greenglass House was (as did Lory, Ana, and Kim in the comments section). 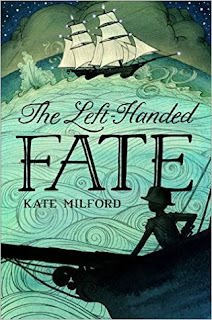 Now that I've read my second Kate Milford book, the newly-released The Left-Handed Fate, I have to do it all over again. Set in the same slightly-askew Nagspeake-ian universe, this is a nautical adventure full of peril, mystery, magic, and more. The story takes place right at the start of the War of 1812, off the east coast of the United States. The Left-Handed Fate is a British privateering ship, currently assisting young natural philosopher Max Ault to continue the work his father began -- namely, to find the pieces of what might be a weapon to end all wars. With the help of the captain's children, Lucy and Liao, and the rest of the Fates, there is a race over sea and land to solve this mystery and escape the mysterious men in black and the dastardly French. Now, I keep writing sentences here and then erasing them because they are too bland and formulaic and this book is the exact opposite. It's chock-full of battles and races and puzzles and magic. There are tiny romances and slightly larger betrayals and kids who are learning and growing and figuring out their value systems. There's also enough history to get the reader interested in finding out more. I adored it all. I read so fast that my eyes hurt but I also kept slamming the book shut when the intensity rose to an almost unbearable level. I wished it would never end but also couldn't get to the resolution fast enough to calm my pounding pulse. It was definitely all I look for in an RIP read! As I near the end of my Top 100 Chapter Books project over at The Estella Society (I'm on book #88/100 right now), I've determined that one of the main qualities of a truly great middle-grade story is that it should be a satisfying read for a wide range of ages, including adults. This book, with its light dusting of mild swears and truly adult dilemmas, was entirely satisfying to me while also being a book that I plan to hand right over to the twelve-year-old boy sitting next to me. It's so incredibly fun. You are going to love it! Must get my hands on it! My local library doesn't seem to have discovered Kate Milford. I need to correct that. But she's an author I have no problem buying for myself. See, I have never regretted reading a book that you and Ana and Kim all loved. (Have I? No, I don't think I have.) I tried one Kate Milford book a while ago and didn't reeeeeally get on with it, but I trust y'all's judgment! I will try again! Well, I think you said before that you tried Boneshaker and I haven't read that one but the world/setting for these two is really cool. Try this one or Greenglass House and I bet you'll be drawn in!